Rated PG for thematic elements. “All Saints” feels like a bit of a miracle. It’s a faith-based movie inspired by a true story that lets its dramatic moments unfold without relying on melodrama. 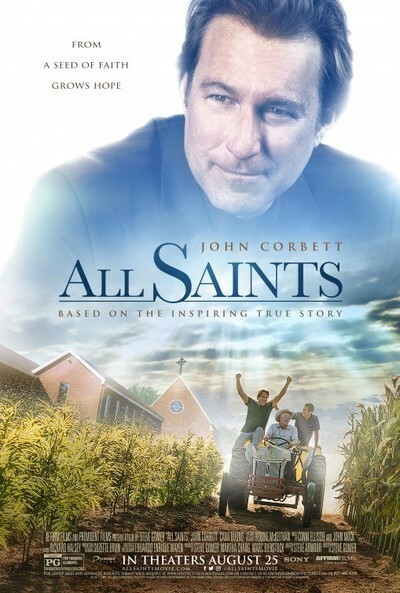 And while its characters speak frequently of the power of prayer and signs from God, “All Saints” isn’t preachy or heavy-handed from a biblical perspective, which might make it more accessible than other films of its ilk to viewers from a variety of religious backgrounds (or lack thereof). Director Steve Gomer approaches dire and potentially devastating situations in understated fashion, allowing the purity of their prevailing humanity to shine through. This tale of a rural church that came back from the brink of collapse about a decade ago is full of highs and lows, hopes and disappointments. But a well-chosen cast, led by a hugely appealing John Corbett, keeps the material emotionally grounded. Corbett stars as Michael Spurlock, a former paper salesman who’s recently followed his calling to be a pastor. For his first big assignment, the diocese sends him and his family to All Saints Episcopal Church in Smyrna, Tennessee, just outside of Nashville. The church is broke and membership is dwindling; Michael is there to inventory the property and oversee its sale to make way for a big-box store. Michael promises his bored son, Atticus (Myles Moore), that it’ll only be “a couple months,” while his former journalist wife, Aimee (Cara Buono), tries to make the most of it by starting a choir. Meanwhile, skeptical locals—led by a cantankerous Vietnam veteran (a perfectly cast Barry Corbin)—don’t exactly welcome the family with open arms. Clearly, a Capra-esque change of heart is in store for everyone, otherwise there’d be no movie. But the road there isn’t nearly as predictable as you might expect from the outset in the script from Steve Armour. “All Saints” may seem a bit sitcom-y off the top as it affectionately plays up the folksiness of these small-town folks. (Gomer has a lengthy history of directing dramatic TV, and it shows in some of the pacing and unfussy camerawork.) And it’s clear that Michael was a bit show-offy and insubordinate in his previous career, which threatens to manifest itself in his newer, humbler profession and set up a wacky culture clash. But as the story settles into a groove and its central conflict develops, it becomes unexpectedly compelling. A week away from the church’s scheduled demolition, dozens of refugees from war-torn Burma arrive. They are ethnic Karen farmers with no money and no place to go, and their leader, the kind and thoughtful Ye Win (an excellent Nelson Lee), is one of the few who speak English. Soon afterward, Michael believes he hears the voice of God telling him to fight for All Saints by having the Karen stay and farm the land surrounding it, providing them with food and shelter and creating much-needed income for the church. Intriguingly, though, others wonder whether Michael is truly hearing the voice of God and not just the sound of his own savior complex, including his boss, the no-nonsense bishop (Gregory Alan Williams). It’s one of many examples of characters questioning the will of the Lord and their own faith in conversations that feel refreshingly honest, direct and heartfelt. In executing their plan to plant tomatoes, corn and other vegetables, Michael and his team hit more than a few snags, and even some of their triumphs end up being short-lived. But they persevere through the power of community—which may sound hokey, but Gomer’s wise restraint makes it ring true. Corbett finds just the right tone in every situation, too, from charmingly swaggering to quietly searching. He enjoys great chemistry with Corbin (as well as a nice “Northern Exposure” reunion), who steals every scene he’s in whether he’s ranting or serving as a seasoned voice of reason. And, as Michael’s wife, Buono gets a chance to show spine and shading rather than functioning as just the dutiful, supportive spouse. Adding to the feeling of authenticity, “All Saints” was shot at the actual All Saints church in Smyrna, with several real-life parishioners playing themselves. And if this small, sweet movie opens people’s eyes to the importance of welcoming refugees in need—especially during a time when notions of rejecting them unfortunately are taking hold—well, that’s just an added blessing.